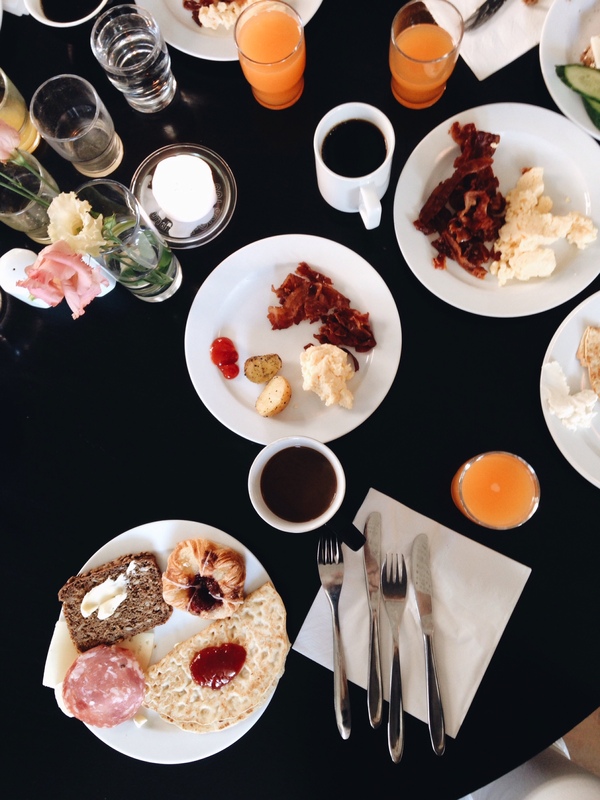 The Notes from Copenhagen serial continues with bed & breakfast tips in the city. Where did we sleep, and where did we breakfast during the 5 days and 4 nights in Copenhagen this Easter. And coffee, of course. First of all, we had booked a hotel room with breakfast, so most of the days it was hotel breakfast calling. Nevertheless, there was a morning, the first one, when we landed Kastrup already before 9am* in a need for late breakfast and good coffee. So after bringing our bags to the hotel we were graving for food and coffee, and as the lucky girls as we are, we accidentally found the place to enjoy breakfast / brunch in Copenhagen. For couple of reasons me and my travel companions are quite loyal Scandic customers. Or should I say, friends. And so it was that for the same couple + few extra reasons we spend the Easter in Scandic too; more precisely Scandic Front. Not extra fancy, but good enough. And when it comes to the most important part, the breakfast, it had probably the best coffee I’ve ever had at hotel breakfast (served from Stelton; thumbs up! ), excellent crispy bacon, good bread, cheese and fruits made it almost perfect. But only almost, because I did miss fish, which they, to my surprise (it’s by the sea, come on!) didn’t serve. The room was spacious enough for three women, it had good views (as a person who’s been stuck at inland for too long it’s always amazing to have the sea view), and when the construction projects nearby; the Inderhavnsbroen and Kvæsthusprojektet will be ready, the hotel location will be one of the best ones in town. Therefore, I expect rate upgrades to come. This time I didn’t have time to try the gym or sauna (all the walking, cycling, dancing and morning “yoga” worked almost as well) but if I ever get back I’ll try those too. Especially during the winter months the sauna would be extra nice. When I was living in Copenhagen back in 2011, I rarely visited this part of the city. I mostly passed it, cruising past Kongens Nytorv to Christianshavn, and other way round. But now, seen the newly opened places and development projects going on, I notice how much more these hoods attract me now. I’m definitely going back, both to the streets and cafés. And the Little Mermaid, of course. *Kastrup’s my favorite airport in Scandinavia, with smooth connections to city and vice versa, excellent food, shopping and lounges. **No, I have no idea why I have too pairs of knife and fork. Though I like to eat double the amount normal people do, especially on hotel breakfast.